In 2009, I had the special privilege of becoming involved with telemetry research in wild sea ducks in the Atlantic Flyway (see May, 2009 news update). I accompanied Drs. Glenn Olsen and Matthew Perry from Patuxent Wildlife Research Center (PWRC) to New Brunswick and helped implant satellite transmitters in 20 black scoter there. It was a great experience and has evolved into an ongoing research project. Our goal is to help determine the best ways to perform the implants and care for the birds afterwards so that we optimize the birds? chances of full recovery and, in turn, optimize our chances of collecting unbiased data on the migratory movements of the ducks. I wrote a study proposal for this research and with the excellent advice of Drs. 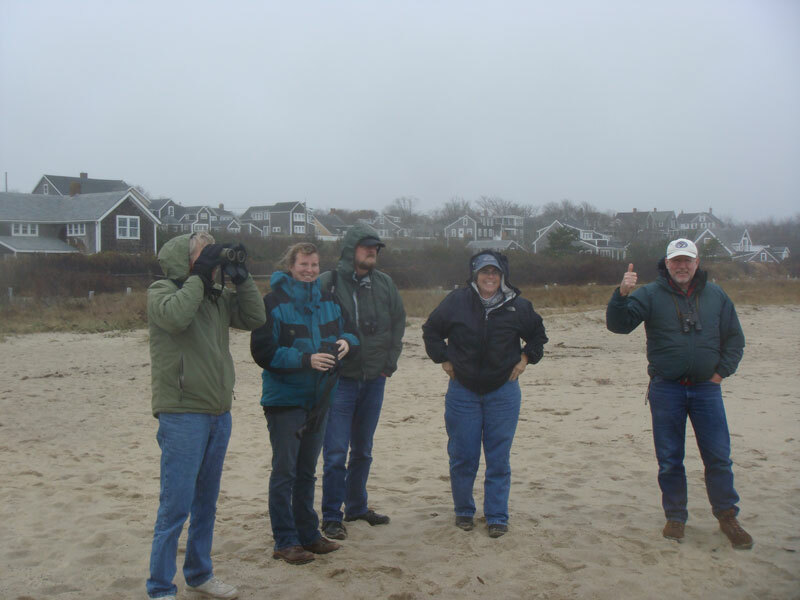 Perry, Olsen, and Alicia Berlin, it was further refined and we performed our first pilot study in November, 2009 with long-tailed ducks at Nantucket Island, Massachusetts. We plan to conduct further segments of the study in February with long-tailed ducks (Clangula hyemalis) at Nantucket Sound and again in New Brunswick with black scoter (Melanitta americana). The study is in partnership with ongoing satellite telemetry efforts with the hope of characterizing the movements, population dynamics, and habitat usage of seaduck species in the Atlantic Flyway. These research efforts are in cooperation with the Sea Duck Joint Venture, Canadian Wildlife Service, and the US Geological Survey. In addition, Massachusetts Audubon also funds telemetry work in Nantucket Sound as part of an assessment to see how a proposed wind farm (Cape Wind project) may affect the use of the area by long-tailed ducks. Nantucket Sound is home to as many as half a million long-tailed ducks in the wintertime. Every day through the winter, hundreds of thousands of the ducks stream past the ends of the island moving from the Sound and out to sea by day and back into the Sound in the evening. Our partner study involves collecting blood and feces from the ducks from the point of capture through release. These samples will be analyzed for stress indicators such as elevated heterophil to lymphocyte ratios (types of white blood cells) and elevated corticosterone. Recovery of feather integrity (e.g., waterproofing) will also be evaluated and body weights and measurements will be collected. In addition, birds are kept longer than usual, up to three days after surgery, and given a special tube-feeding diet (Lafeber Emeraid Exotic Carnivore, Lafeber Company, 24981 N. 1400 East Road, Cornell, Illinois 61319 USA) to see if this extra time and care helps them recover from surgery better prior to release. The question on the minds of many biologists is whether this extra attention is more stressful and ultimately detrimental. Implantation of satellite and VHF transmitters has been performed since the 1980s. For the most part, birds have been released within a few hours of surgery and, for the most part, survival rates have been acceptable for the purposes of the studies. There are almost always some birds that die within a few days of release and, in some species and some release situations, the numbers are much higher. This is obviously bad for the birds, but also bad for the biologists since there is a great expense involved. Even more, the deaths of some birds could have implications as to the reliability of the data collected from the rest of the birds. Although some studies have shown that normal behavior and even breeding is possible, it is still possible to have some artifactual changes to migration or other behaviors. Some studies have attempted to answer this but few have focused on whether alternate care techniques may make a significant difference upon survival. The bottom line is that everyone wants to do what is best for the well-being of the birds and for the integrity of their scientific data. So research and refinement of surgical techniques and post-operative care is encouraged. Our pilot study with long-tailed ducks at Nantucket Island in November, 2009 produced some encouraging results. Most notably we saw an improvement in weight maintenance as compared to 2008 despite keeping the birds for additional amounts of time. Further efforts will take place with long-tailed ducks again in February in Nantucket Sound and in New Brunswick, with black scoters, in May, 2010. On a personal note, I am very excited to be participating in this research. It represents some of the best parts of being a wildlife veterinarian. I enjoy working with wild birds in spectacular places alongside outstanding people and feeling that I am making a positive contribution to wildlife conservation and welfare. To some it may not sound like fun to be bouncing around in a boat in the middle of the night catching ducks. But seeing these birds up close, thriving and at home in the dark, tossing sea is an extraordinary experience that few have the privilege of witnessing. I would like to acknowledge the financial assistance of the Sea Duck Joint Venture (www.seaduckjv.org) and the cooperation and excellent technical assistance of Drs. Mathew Perry, Glenn Olsen, and Alicia Berlin of the USGS Patuxent Wildlife Refuge (www.pwrc.usgs.gov/resshow/perry/scoters). I also appreciate the cooperation and efforts of Mass Audubon (www.massaudubon.org). Ted Lafeber and the Lafeber Company (www.lafebercares.com) has generously provided their Emeraid Carnivore product for use in our study. You can also be involved in this work. Visit the websites of the associations mentioned above and consider making contributions to them or at least letting them know how much you appreciate their work. Also, you can consider booking me for a speaking engagement for your local group or school. It will spread the word and any financial contributions help make my services affordable for the organizations I work with (much of which has been pro bono). 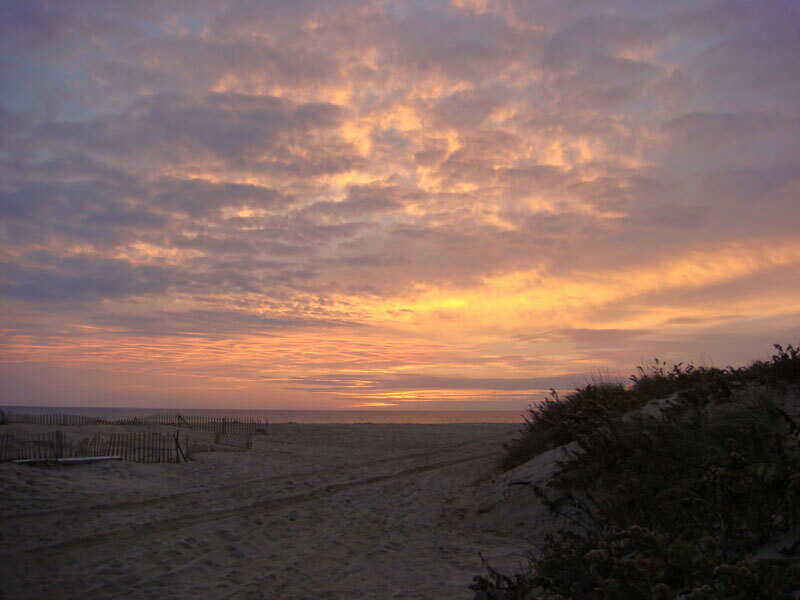 Figure 1: Although the sunsets are breathtaking on Nantucket Island, even more amazing to a birder are the thousands upon thousands of ducks that stream around the ends of the island every morning and night. They commute back and forth to the open sea where they do the majority of their feeding. Figure 2: Life at sea is tough! 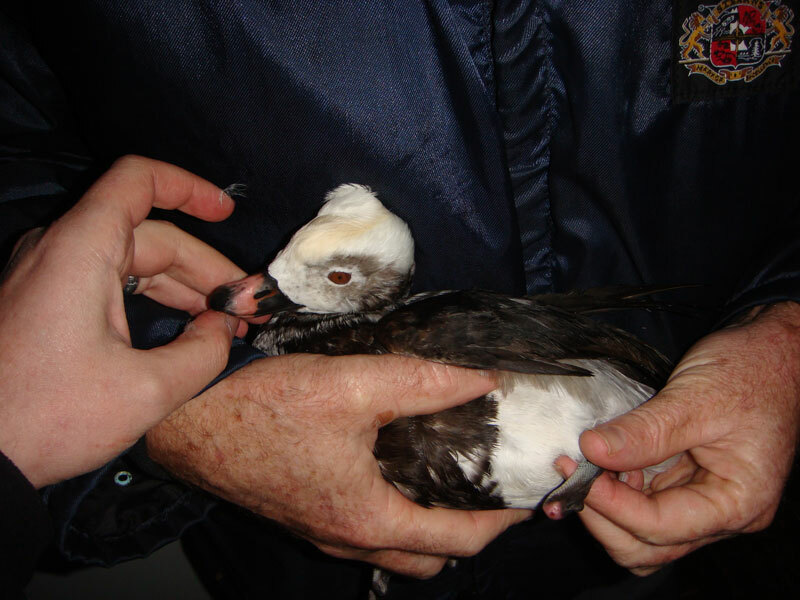 This adult male long-tailed duck lost his foot some time before we ever netted him. It?s very possible he lost it to loose fishing gear or other trash, as this is often documented in rehabilitation centers. But maybe a close call with a hungry fish? Who knows. He seemed relatively healthy but we didn?t risk adding to his problems and let him go shortly after capture. Figure 3: Normally a seaduck?s down is kept dry and fluffy (left) under a watertight covering of contour feathers (right). The feathers on the right are actually not as water repellent as they are normally. Usually birds will come right out of the water and be dry in the hand whereas some water is seen sticking here. Figure 3: Here, we are checking the beaches for more seaducks. From left to right: Peter Osenten, Dr. Alicia Berlin, Dr. Glenn Olsen, Edie Ray, and Dr. Matt Perry. 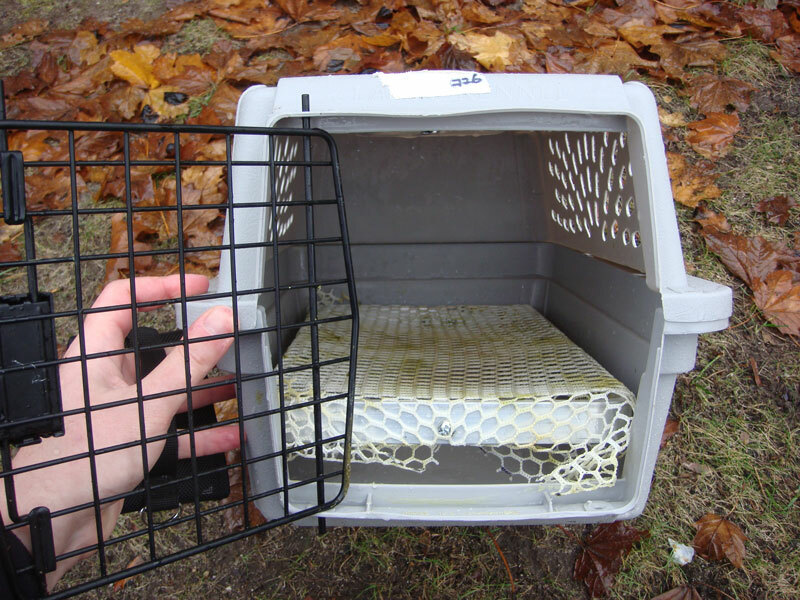 Figure 4: One of our modifications to perioperative care has been the use of net bottoms in our bird carriers. The net bottom distributes weight better, which is important for birds with more rearward placed legs such as seaducks. The mesh also keeps feathers cleaner and is quickly removable for easier cleaning. 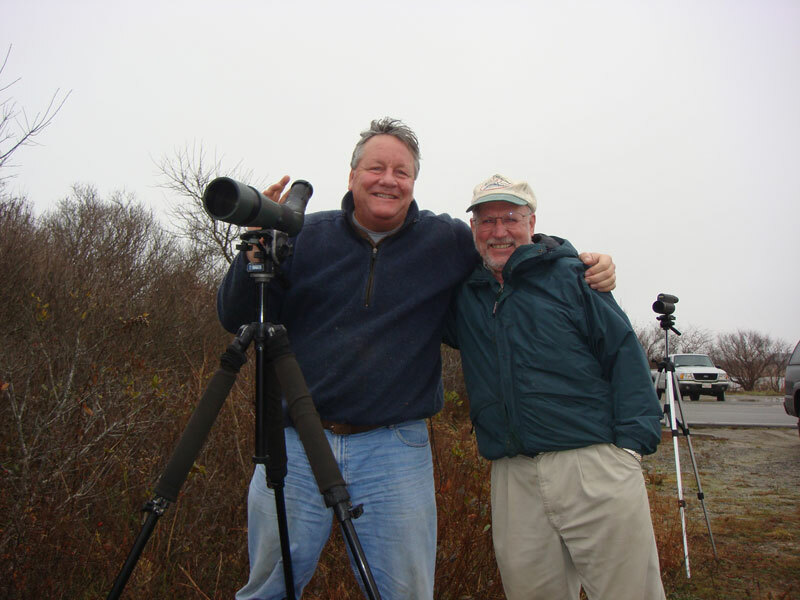 Figure 5: Local birding guru Vern Vaux and Dr. Matthew Perry exchange a friendly hug. Vern helps immensely by keeping a sharp eye on our freshly released birds.